We all know that we should plan ahead for health emergencies, but we often put that off because we are feeling fine today. However, when something serious happens and we need help, such as an unplanned trip to the hospital, the people who we depend on may have a hard time thinking about what information to bring, who may need to be contacted, and where the critical information is located. After all, it is an emergency! Having any hitches in providing critical health and personal information to medical providers in an emergency is not an issue that our loved ones should have to deal with and it is preventable with planning and organization. For this reason, our Lifetime Planning financial advisors help our estate planning clients put together a Critical Information Vault (“CIV”). 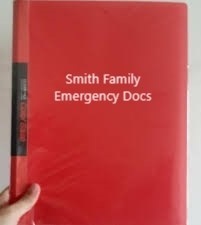 This is a “grab and go” hard copy small file box that contains the essential documents needed if you or a loved one were to have to go to the hospital or get medical care in an emergency. In addition to the CIV, we recommend that each person have a File of Life magnet stuck on their refrigerator door or other obvious location. This is small red magnetic holder that contains medical information about you. EMTs and other emergency personnel in Ventura County are trained to look for these on people’s refrigerators. It could make a big difference for the first responders to have this information from the beginning. The CIV is also great for non-emergency estate planning information. Since you are storing important information in this file box, it can also hold a “thumb drive” with a digital copy of your current estate planning documents such as your living trust, wills, and powers of attorney. In addition to the estate plan, the CIV documents can detail where the original estate planning documents are kept and also alert your trusted successors to what online or “E only” accounts, computer passwords, and other digital information you have and that they might need access to. With digital accounts and assets, there will usually be no hard copies coming in the mail for those accounts that you have put on “E statements.” This lack of paper statements makes it tougher for trusted people to find these accounts later on. For this reason, you should also keep a list of “Digital assets” and accounts, and keep it updated routinely. Passwords or sensitive information should be protected from others except your trusted successors. Sharing the location of your CIV with your trusted successors will make it much easier for them to help. While it helps to centralize all the vital information, it is important to keep the CIV light and portable enough so that it can be taken and be practical in an emergency. If you will keep hard copies of all of your estate planning documents in it, make sure to have a section (or just one folder) of the CIV that can lift out so that hospital and medical information could be separated from the rest. After all, you don’t want to run into the ER with five pounds of files in a giant box and have to sort through them! Finally, there are also secure online “vaults” that can store cloud-based copies of your estate planning documents. Talk to your advisor about how this might be a benefit for you and your family. Lifetime Planning & LPL Financial do not provide legal advice or services. Please consult your legal advisor regarding your specific situation.